Be the first to share your favorite memory, photo or story of Edith . This memorial page is dedicated for family, friends and future generations to celebrate the life of their loved one. 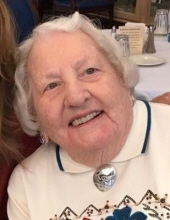 Edith Hough Ruhlman, 98, of Sun City West, AZ passed away peacefully on Saturday, December 8, 2018 surrounded by family. Prior to moving to Sun City West in 1988, she was a lifelong resident of Trenton and Pennington, NJ. Edie was a graduate of Trenton High School and Trenton State College (now The College of New Jersey) in Ewing, NJ and later obtained her Masters in Education going to school at night. She began her career as a kindergarten teacher at Pennington Primary School in Pennington, NJ and later became its Principal where she worked for over 25 years. After retiring, Edie volunteered for many years at Mercer Hospital in Trenton, NJ. Edie was married to the love of her life, Cassel R. Ruhlman, Jr. for 53 years before he passed in 1995. She and Cass enjoyed years of snow skiing, tennis and traveling together with friends. They spent a part of every summer, and after Cass retired, every summer, at their camp in the beloved Adirondacks in upstate NY. It was there where she brought together family members near and far and where her family will continue her legacy of good times spent with family and friends. She enjoyed playing bridge, board games, doing jigsaw puzzles and teaching her grandchildren and great-grandchildren the finer points of (and how to be good losers at) Gin Rummy and Hearts. In Sun City West, Edie perfected her golf game, going on to win octogenarian golf tournaments. She was an active volunteer with the Sun City West PRIDES (Proud Residents Involved Doing Environmental Service) and could be seen out on the roads on Saturday mornings helping keep up the neighborhood. Edie was also a member of the Sun City Niners Golf League where she was the Secretary for a period of time. She enjoyed going to the theater, attending sporting events and dinner with friends. Daughter of the late Leola Moore Hough and Douglas Ralston Hough, Edie is survived by her sister, Dorothy Urban, Oceanside, CA; her daughter, Judith R. Weinstein, Surprise, AZ; her son, Douglas H. Ruhlman, Montgomery Township, NJ; seven grandchildren (Scott, Rachel, Brian, Clint, DJ, Bob and Sean); seven great-grandchildren (Matthew, Caroline, Jack, Zachary, Ben, Sam and Emma); and many nieces and nephews. Edie will be remembered by all who knew her as the life of the party. She had a remarkable life lived with vigor, passion and the love of family and friends. An open house will be held on Sunday, January 6, 2019 from 1:00 to 4:00 at the home of Judy and Steve Weinstein, 21705 N. Black Bear Lodge Dr., Surprise, AZ. A memorial service will be held in June 2019 at Blackwell Funeral Home in Pennington, NJ. The family asks that in lieu of flowers please consider a donation to Hospice of the Valley at https://www.hov.org/donate/ or 1510 E Flower Street, Phoenix, AZ 85014. To send flowers or a remembrance gift to the family of Edith Hough Ruhlman, please visit our Tribute Store. Guaranteed delivery before Edith 's memorial service begins. The family asks that in lieu of flowers please consider a donation to Hospice of the Valley at https://www.hov.org/donate/ or 1510 E Flower Street, Phoenix, AZ 85014. "Email Address" would like to share the life celebration of Edith Hough Ruhlman. Click on the "link" to go to share a favorite memory or leave a condolence message for the family.